Las Vegas has one of the fastest-growing housing markets in the U.S. Its school district wants teachers to move there before it’s too late. When Gabriela Kula moved to Las Vegas last fall to teach eleventh-grade English, she wasn’t sure what to expect. It didn’t have the beaches of L.A., where she grew up, or the historic vibe of Boston, where she went to college. But it had one clear advantage: the cost of housing. In Las Vegas, she can afford “a beautiful condo.” She can save every month. “I would totally live here long-term,” she said. As other big cities become increasingly unaffordable for teachers, Las Vegas is looking to recruit young teachers like Kula by touting its relatively affordable housing. It even has a new program that’s helping teachers buy homes. 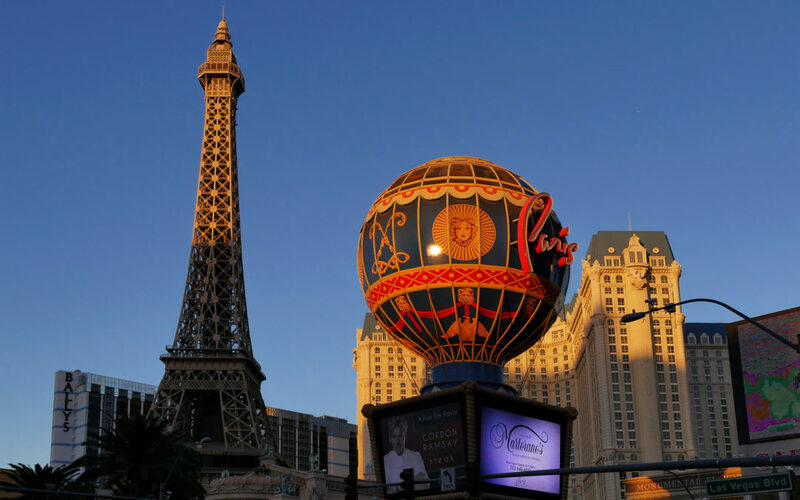 But with home prices quickly rising in Las Vegas too, the city may be running out of time. Las Vegas now has the second-fastest growing housing market in the U.S. after Seattle. Prices there have increased almost twice as quickly as the national average. A lack of available housing in cities nationwide is driving up the prices of existing homes, making it harder for teachers to find affordable housing in the communities where they work. That can affect the academic success of students. When teachers spend more time in the communities where they teach, they can participate in more community and school activities. They can establish better relationships with students and their families, and become trusted community members. Academic research has shown this helps students perform better. But across the country, many teachers can’t afford to live near where they work. Of the five largest school districts in the U.S. — New York, Los Angeles, Chicago, Miami and Clark County, which includes Las Vegas — only Clark County and Chicago are affordable on teacher salaries there, according to Trulia, a real-estate listings company that also researches the housing market. In response, cities are establishing programs to help teachers find housing. There are subsidized apartment complexes in San Francisco, Washington D.C. and Newark, N.J., and networks for teachers in New York City such as TeacherSpaceNY. Nevada has created a program called Home is Possible for Teachers to help teachers settle in before the housing market becomes totally out of reach. The program offers a below-market interest rate of 4.25 percent on a 30-year mortgage, and a prorated loan of $7,500 that teachers can use towards their down payment or closing costs. That loan is forgiven if teachers live in their house for five years. But the teachers’ program is temporary and expires on Sept. 30, 2018. Until then, the state will continue to work by partnering with lenders, who qualify teachers for the program — and teachers can then work with realtors to find the homes that suit their criteria. Dwight Pace, a communications officer for the program, said 430 teachers have used the program to buy homes. 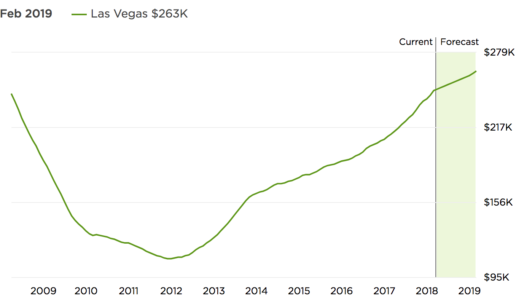 Home price projections in Las Vegas. 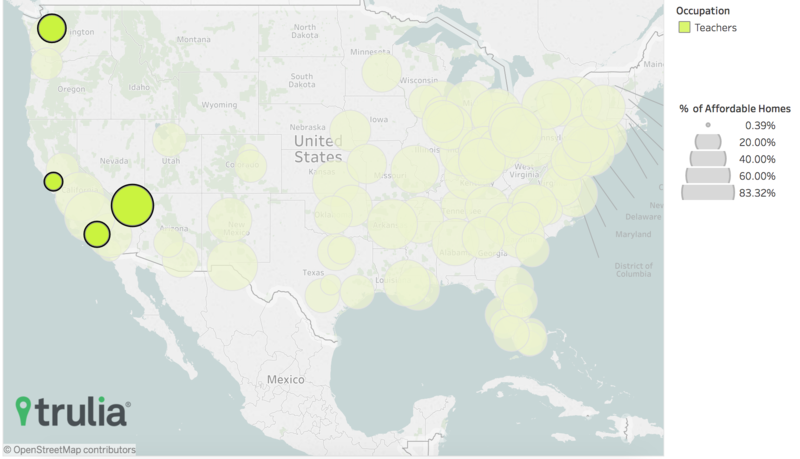 Source: Zillow.com. 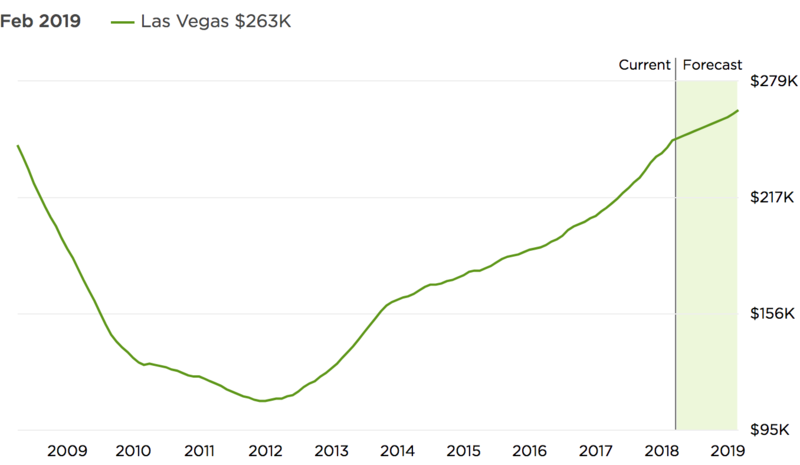 The median Las Vegas home price is just under $250,000, but prices increased by more than 16 percent in the last year. Few new homes have been built, making existing ones grow more valuable. Home prices in Las Vegas compared to the 20-City average, according to the Case-Indices from Standard & Poors. Source: Federal Reserve Bank of St. Louis Economic Data. Still, while home prices are rising quickly in Las Vegas, the city remains affordable compared to many cities in California and other states. Trulia found that about half of Las Vegas homes available for sale are affordable for teachers (meaning that 31 percent or less of one’s income is spent on housing). In Seattle, the only city where prices have increased faster than in Las Vegas, only 21 percent of homes were affordable. In nearby Los Angeles, where Las Vegas-based teacher Kula grew up, 17 percent were affordable — and in Oakland, CA, affected by gentrification in San Francisco, only 8 percent of teachers can afford homes. Jody Weverka, an English teacher at Piedmont High School — which is next to Oakland’s school district — bought her two-bedroom house in Oakland in the 1990s and has lived there ever since. She and her husband once considered moving to a bigger house to accommodate their two kids. Then they researched the prices of nearby homes. “We couldn’t afford to live in our own neighborhood,” she said. When home prices increase, so does the amount of money required for a down payment. That leaves potential home buyers chasing a moving target, Gumbinger said. Given Las Vegas’ fast-growing home prices, the prospect of buying a home with a teacher’s salary may soon become out of reach.